Showing results for tags 'M7'. Beautiful, fully functional and well maintained M7. Original box, leather half case, strap, cap. I'd sell in Europe, preferably by IBAN payment. CineStill film in Brooklyn and NYC. I was able to put a few rolls of CineStill film through my new (to me) M7 last weekend. If you haven't tried CineStill, you should give a shot! It's Hollywood movie stock that has been re-purposed for 35mm stills and normal C-41 processing. It comes in 800T (low light Tunsgten balanced) and 50D (bright Daylight). It's a really nice alternative to "regular" film. Forgiving and super easy to scan without a lot of fiddling around in post. There are some color casts for sure, but that's all part of the look. And the 800T has no anti-halation layer, so highlights get beautifully soft! Love it. All taken with the M7 0.85 + VM 50/1.5. "Scanned" with an A7ii + Tamron SP 90mm and lightbox. 800T - Very "Arty" color, and nice grain. 50D - Reminds me of Portra 160, but less grain, sharper and a little more "pop". Unterwegs bei schönem Wetter in der Eifel. M7 + sumicron50 + Kodak Portra160. Belichtet wie 100ASA, scan von Meinfilmlab. Bild wurde von mir verkleinert, wahrscheinlich sehr stümperhaft. So, as you do, I was still on the quest for a perfect day bag for my 2 cameras: The Q and and M7. I have neoprene protectors, but was only taking one or the other out with me at a time and sometimes I still wanted something to put them into (one or both) when not shooting. I want to take both, but am very fussy about the amount I carry. Confused, yup! I had the Domke F803 but found the lack of padding and the width of the inserts all wrong for the Q and also got sick of adjusting the strap and the bag just generally getting in the way. I couldn't see a review for this one on the forum when I came across it, so here is the bag: http://www.artisan-n-artist.com/product_detail.php?id=271 This bag doesn't seem to have made much of an impact as I couldn't find any reviews or references to it but I think it has really slipped through the cracks of perfect bags for camera weight weenies. I didn't want to pay the new price ($240, I'm also a tightwad)) and found only one on that auction site for sale anywhere and at a very reasonable price. Adjustable shoulder strap (like the AnA one I have on the Q but wider and more robust) and just the perfect size, great padding and quite unobtrusive. Also it's left/right adjustable so you can have the bag on one side out of the way and the camera on the other and still room for another camera, lens, tablet, filters and spare batteries. If you have small lenses and want to travel light for the day and compact I think this is perfect! (nb. I have no affiliation with Artisan and Artist, but defo would if they gave me free stuff to review ) I think I've finally found the perfect day bag. I shall now have a day of rest. How do I take a selfie with this thing? Hi, I'm a newbie (to Leicas and this forum) from Scotland. In the last 6 months I've traded-in all my Canon DSLR gear for a M7 and 50mm Summicron, and just last week I've picked up a M3. Apart from being a bit dirty inside, which I wasn't expecting seeing as I'd bought it from an authorised Leica dealer, it is in great condition with no obvious issues with patch alignment, shutter speeds etc. I put my Summicron on it today and noticed that the patches don't move through the full range of lens focusing distances; the infinity end seems ok but at the close focusing end the patches won't focus any closer than approx 3 or 4 feet i.e. as I move the focus ring past 4 feet towards the closest setting the patches stop moving. 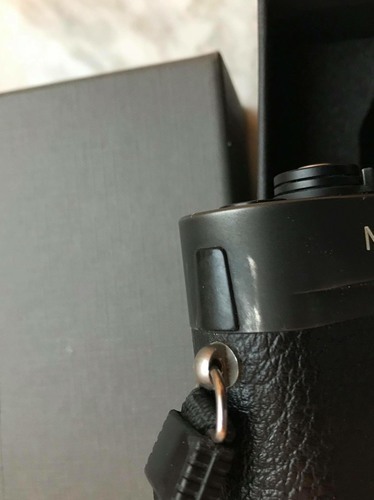 On my M7 the patches cover the full focusing range of the lens. As I said I'm a newbie to Leica and rangefinder cameras in general so just wanted to ask am I missing something obvious here or do I have an issue? Thanks in advance if anyone can help. Cheers, Liam. A new small project: Kodak 5222 Double-X in my M7. http://motion.kodak.com/motion/uploadedFiles/Kodak/motion/Products/Camera_Films/BW_Negative/Technical_Data/5222_ti0299.pdf Kodak 5222: Daylight: iso 250 Tungsten light: iso 200 Finer grain compared with Tri-X 400 Higher resolution then Tri-X 400 Available in 122m/400ft or S/E. The coming week I will play around a bit with this (cine) film.